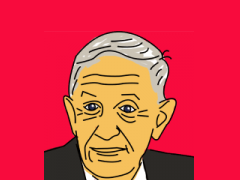 John Forbes Nash Jr. is an American mathematician and co-recipient of the 1994 Nobel Prize in Economics for his work on game theory. He is also the subject of the 2001 film ‘A Beautiful Mind’. John Nash Jr. was born in Bluefield, West Virginia in 1928 to John Forbes Nash (Senior) – after whom he was named – and Margaret Virginia Martin. John Nash Senior served in the army during WW1, then lectured at the University of Texas for a year before joining the Appalachian Power Company in Bluefield. Margaret Virginia Martin studied languages to University level, then became a schoolteacher for ten years until marrying Nash Senior in 1924. Nash Jr. was closer to his Mother than his Father, and credits her with teaching and encouraging his intelligence during his childhood. As a child, Nash was recognised as bright but unsociable, resulting in his Mother actively encouraging his younger sister, Martha, to involve him with her friends. Nash first showed an interest in Mathematics from around 14 years old, when he began to prove results found in E. T. Bell’s Men of Mathematics. During high school, Nash took classes at Bluefield College. While his Mother advocated his early admission to college, Nash was prevented from skipping school grades by government officials. Nash has stated that he believes he could have graduated from college around the age of 15 or 16, had he been given the opportunity. Nash entered Bluefield College in 1941 to study mathematics and chemistry, his favourite topics at the time. He remained unsociable and was generally thought odd by classmates. In 1945 Nash entered the Carnegie Institute of Technology (now Carnegie-Mellon University) funded by a scholarship and intending to study chemical engineering. Shortly after arriving, Nash’s mathematical talent was recognised and he was encouraged to become a mathematics specialist. In 1948 Nash graduated with a BA and an MA in mathematics. In September 1948 Nash entered Princeton on the most prestigious Fellowship programme offered by the University. During this time, he first showed an interest in game theory and, in 1949, wrote the paper on game theory which would win him a nobel prize many years later. Again, he was recognised as antisocial by classmates and colleagues, and reportedly avoided attending lectures. In 1950 Nash received his doctorate from Princeton and became a leading expert on the Cold War conflict using his work on non-cooperative games. However, some faculty members at Princeton were reluctant for him to join the teaching staff, due to his hostile nature. From 1952 Nash taught at MIT, using unorthodox and unpopular teaching methods. During this time Nash began to suffer personal problems. He is reported to have had relations with male students, as well as meeting Eleanor Stier, with whom he had a son, John David Stier, in June 1953. In the summer of 1954 Nash was arrested on charges related to homosexuality and dismissed from RAND, the organisation he was working for at the time. By the summer of 1955 Nash was seeing Alicia de Lardé and Jack Bricker, both students of his at MIT. In the spring of 1956, Stier discovered the relationship with de Lardé and de Lardé became aware of Nash’s history with Stier and their child. Around this time Nash’s father died. Reportedly, Nash felt the death was due, in part, to shock from the discovery of Nash’s various affairs and the existence of his child. In 1957 Nash married de Lardé. While she was pregnant with their child in 1958, Nash first began to show signs of mental illness. His condition quickly worsened and de Lardé had Nash admitted to McLean Hospital involuntarily. On release, he resigned from MIT and moved to Europe. After a brief stay, the couple returned to Princeton, where de Lardé began to work. Nash’s illness worsened and in 1961 he was committed to Trenton State Hospital, where he underwent aggressive and only partially successful treatment. In 1962 de Lardé divorced Nash. Nash slowly recovered and began to resume mathematical work. In the 1990s Nash announced his recovery from schizophrenia and was awarded the 1994 Nobel Prize in Economic Science (with Harsanyi and Selten) for his earlier work on game theory. Since then he has continued work on game theory, wider economics and mathematics. In 2010 he was awarded a Double Helix Medal for his academic contributions and named a role model for people with mental illness. Nash’s 1950 doctorate thesis ‘Non-cooperative games’, is the academic contribution for which he is most famous. The paper contains the definition of what is now known as the ‘Nash equilibrium’, an integral concept within game theory. The ‘Nash equilibrium’ is the solution to a non-cooperative game. In a Nash equilibrium, every player is playing the strategy which is his best response to the strategies being played by all other players. That is to say, no player can benefit from changing their strategy, as long as all other players keep their strategies the same. As a result, no player has an incentive to deviate from the strategy they are currently playing. In 1952 Nash published a paper named Real Algebraic Manifolds in the Annals of Mathematics. The key and ground-breaking finding of this paper is that ‘two real algebraic manifolds are equivalent if and only if they are analytically homeomorphic’. The ‘Nash equilibrium’ theory has been used extensively to analyse the potential outcome following the interaction of various decision-making entities which are interdependent (make decisions taking into account the decisions of other players). Specific application includes war and arms races (most notably the Cold War), collusion of oligopolistic firms, strategies during penalty kicks-offs in football, and environmental degradation due to the self-interested nature of parties involved. Nash is the subject of the 2001 film ‘A Beautiful Mind’, which focuses both on Nash’s mathematical talent and the mental illness which he has suffered from for much of his life. The film has been criticised for inaccuracies and deviations from the true course of events in Nash’s life. Nash himself has stated that he particularly found issue with the conclusion of the film which shows Nash to stop taking medication for his condition.